And I’m back, with the second installment of what the family and I did on our recent trip to Europe. Like I said before, there is a lot to cover and I couldn’t possibly deal with it all in one post. And after we flew in and did our first day of driving and visiting the Beaumont-Hamel Memorial Park, we drove to the first town where we would be rooming on our trip. This is the historic town of Ypres, Belgium (pronounced either as Eep, or Ee-pairs, depending on whether its spoken in French or Flemish). 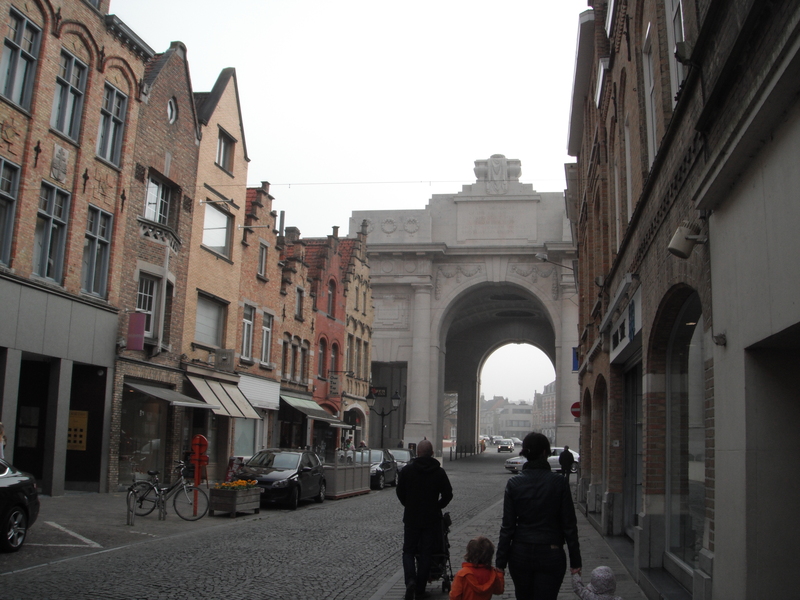 As I said last time, Ypres was our first stop after two days of ongoing travel and very little sleep. And after we rested up and showered, we had some pretty full days experiencing the town and the many cemeteries, memorials and museums that dot the landscape. 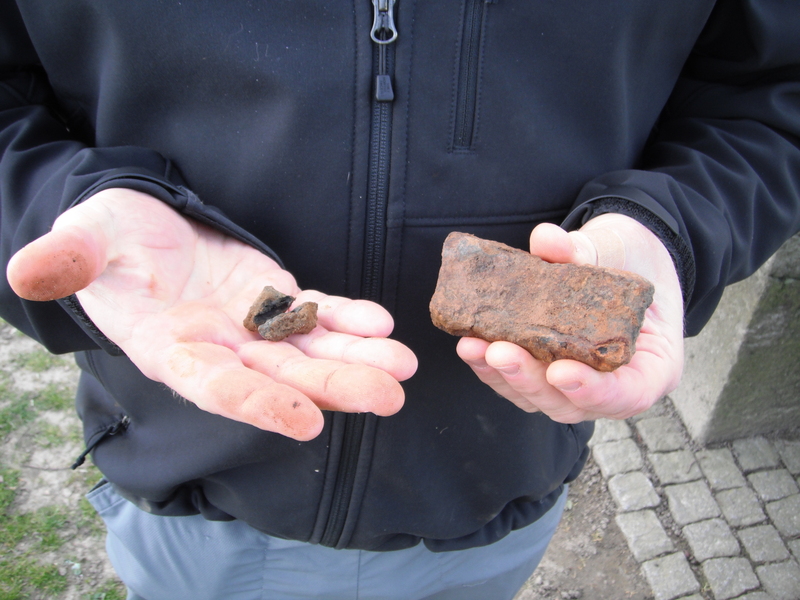 It was also while touring Flemish city and the surrounding countryside that we made what was perhaps the biggest find of our trip – pieces of shrapnel from the war! 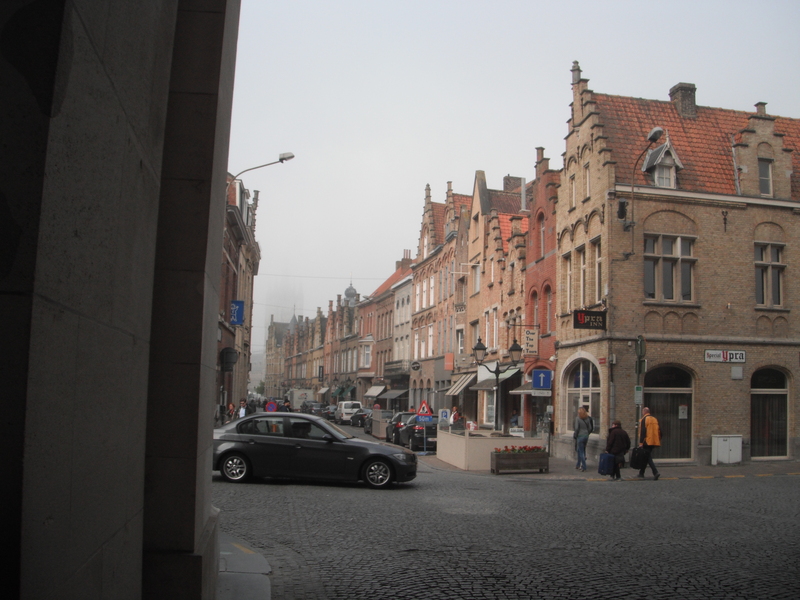 Now for those unfamiliar, this ancient town is the municipal capitol of West Flanders that dates back to before the time of the Roman conquest. During the Middle Ages, it was renowned for its cloth and textile industry, and was even mentioned in the Canterbury Tales due to its extensive trade with England. However, the town is best known due to the fact that it was contested ground for three separate battles during the Great War. During the First Battle of Ypres, which took place from October 19th to November 22nd, the Allies retook the town from the Germans, who had captured it during their initial advance through Belgium. 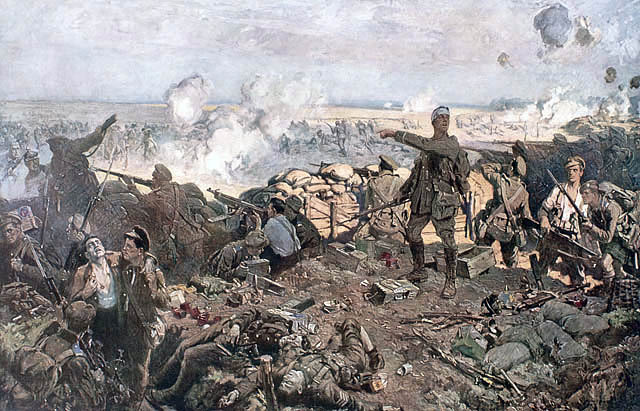 The Second Battle of Ypres – April 22nd and May 25th, 1915 – was where the German army attempted to break the stalemate in the west by using poisonous gas for the first time. It was at this time, as already mentioned, that the 1st Canadian Infantry Division distinguished itself by standing their ground and beating back the German assault. To put this in perspective, the Canadians were an untested unit that had recently arrived in Flanders to witness the terrible carnage that had become of the war. 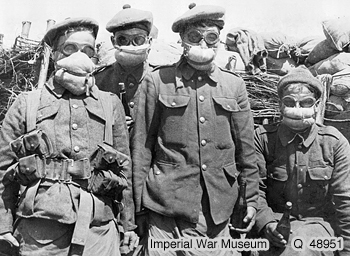 When the Germans unleashed the poisonous clouds of chlorine gas into the city, these soldiers did not yet have gas masks (or proper helmets) and thousands of men began to die. The French and British lines crumbled under the onslaught; but at St. Julien, where the Canadian Division was stationed, an inventive Canadian officer came up with a novel idea that saved them from death and retreat. Remembering a lesson from chemistry class, he ordered his men to urinate on rags and apply them to their faces. Knowing that ammonia, which urine contains, neutralizes chlorine by turning it into harmless ammonium chloride crystals, the Canadian soldiers simply breathed naturally through their urine-soaked rags and waited for the gas to roll over them. When it did, they took up their positions and were there to meet to the Germans when they assaulted. Because of this, the German attack failed, and led Sir George Perley (Canada’s High Commissioner in Britain) to state that the “saved the situation”. British Lieutenant General Smith-Dorrien followed this up with the conciliatory statement that had it not been for the Canadian troop’s gallantry, the initial German breakout that took place early in the battle “might well have been converted into a serious defeat for our troops.” All told, this gallantry came at a terrible cost – with some 5,975 casualties, of whom roughly 1,000 were killed. The battle raged on for many more months, with some 100,000 men being killed, captured or wounded before the end. However, it was The Third Battle of Ypres – also known as the Battle of Passchendaele (July 21st – November 6th, 1917) that was the best-known and bloodiest of the war. After months of fighting, this battle resulted in nearly half a million casualties on all sides, and only a few miles of ground were won by the Allied forces. During the course of the war, the town was also all but obliterated by the artillery fire. These events are commemorated on a daily basis by the town’s people, and the names of those who fell are inscribed on the Mennin Gate, which sits at the east end of the old city. But I’m getting ahead of myself here! Before I can cover all the historic sites we took during the course of our stay, I should mention the hotel where we slept, which was none other than the Hotel Albion. In addition to being located in a building in the old city, the rooms were spacious and beds king-size, which came in handy upon arrival! After waking up on Saturday and getting some much-needed shower time, we enjoyed the hotel’s traditional Belgian breakfast spread. This consisted of hard boiled eggs, sliced meats, cheeses, assorted breads (baguette, croissants, pain au chocolat, etc. ), jams, and of course some really good coffee. After eating and drinking our fill, we set out about town, and our first stop was the Cathedral located next to our hotel. After appreciating the centuries-old architecture, we lit some candles and headed for the center of the old town. Next up was the bookshop my parents had seen on their last visit and wanted to see again, a place called The British Grenadier, which specializes in war memorabilia, books, and historic keepsakes. The guy who runs its, a man by the name of Steve Douglas, just happens to hail from Waterloo, Ontario, where my parents lived and studied for many years before I was born. While there, we chatted with Steve (a rather stoic figure who nevertheless seemed to remember meeting my folks) bought some postcards, poppies, a hat for myself, and marveled at his large collection of wartime artifacts and commemorative goods. After that, it was off to the town market which, since it was a Saturday, was out in full force! Basically, the center of the old town was filled with vendors of every kind peddling snacks, clothing, shoes, fresh meats, fish, cheeses, and even some livestock. After walking through this crush of human activity, we came upon the Cloth Museum. This massively long medieval structure was the heart of the city’s linen and textile trade, and was made incredibly long so that bolts of cloth could be unwound completely to check for authenticity. 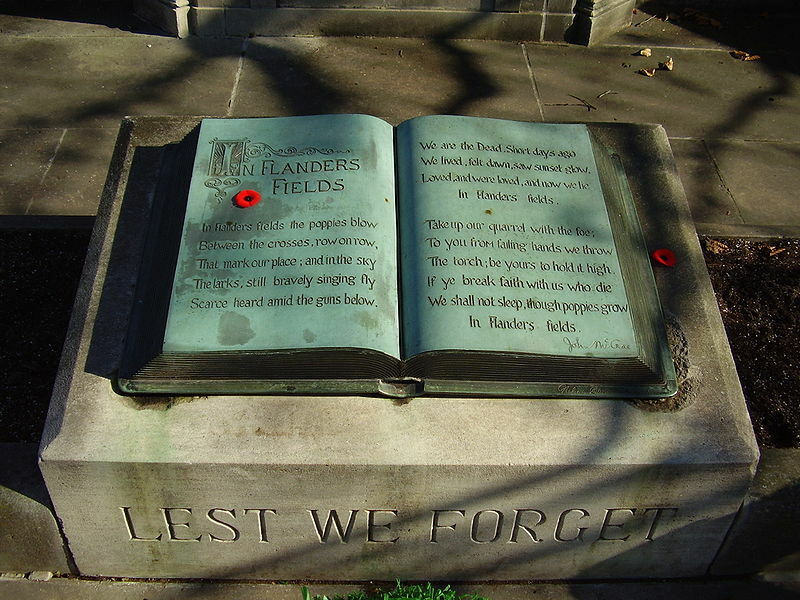 After being almost completely destroyed in the war, the town rebuilt it and renamed it the In Flanders Fields Museum, in honor of the John McCrae poem of the same name. Once inside, we got to see just how amazing it was. The entire museum is kept dark, somber music plays in the background, and multimedia displays show reenactments of various aspects of the war. 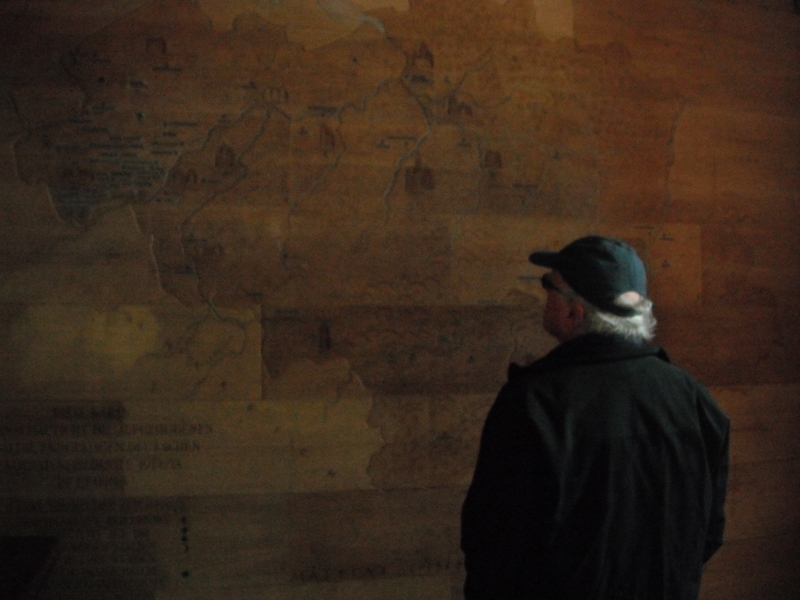 There are also photographs, maps, and artifacts as far as the eye can see. And every visitor is asked to make an account for themselves in the museum database and given a poppy-shaped wrist band that is programmed to identify you. These identifying wristbands not only allow you to get in and out, they also let you access to terminals and have what they call “Personal Encounters”. Basically, this amounts to you accessing various terminals throughout the library and being given information on people who served in the war. Once obtained and compiled to your account, you can request that the museum email it all to you, which I naturally chose to do. The names of my Personal Encounters were Elsbeth Schragmuller, William Flack, and Mike Mountainhorse. Click here to see the museum certificate that contains their bios, and be sure to check out the museum’s website for more information on who they are and what they do. 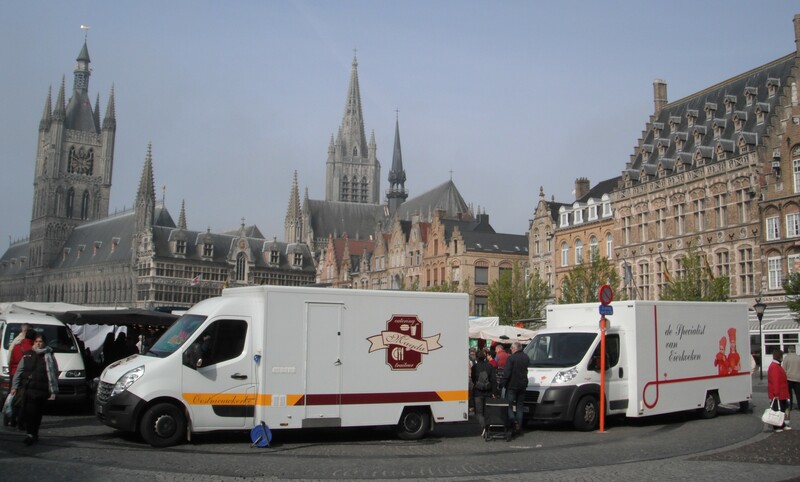 After exiting the museum, we had some lunch from a sausage cart (foot longs with fried onions and some interesting choices of sauce) and headed over to the Cathedral located next door, which was also destroyed during the war. Here, we watched as the local choir was warming up for a big show and lit some more candles. Then it was a quick nap back at the hotel to combat the lingering effects of jet lag followed by some dinner in the market at a place known as Antonio Vivaldis, which my parents had been to the night before. We drank Leffe Blonde, which is available here in Canada but is something of the beer of choice in Flanders. Last time my folks came back, they made it quite clear that this and Kronenbourg (also a local favorite) were now their beers of choice! Then, we walked down to the Mennin Gate to take in the Saturday night ceremony that honors all the Commonwealth soldiers who died during the Great War. 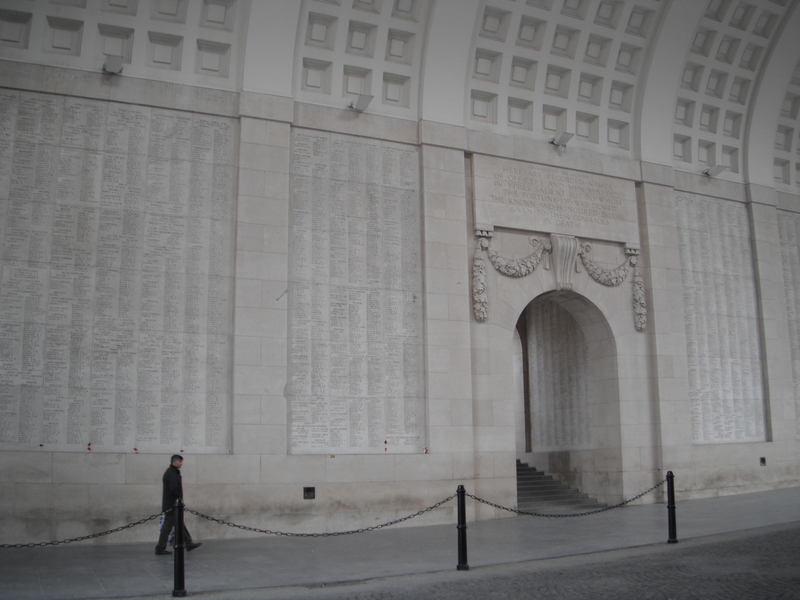 This great archway, which you can see above, has the names of every single soldier inscribed on it, and ceremonies to honor their sacrifice take place every night. Yes, you read that right. EVERY SINGLE NIGHT the people of the town gather at the gate, the local choir sings songs, the Mayor comes out to speak, The Last Post is played, and wreaths are lain. And even though this is a daily occurrence, Saturday is a special night, when the largest and most elaborate ceremony takes place. I should also note that in Ypres, the poppy – as a symbol of remembrance – is worn year round and can be seen just about everywhere one looks. To put that in perspective for us foreign folks, its like having Remembrance Day (Veterans Day, Poppy Day, Armistice Day) every day. None of this once-a-year on November 11th stuff. We then walked the wall, which overlooks the moat that circles the old part of town and also has its share of commemorative plaques and statues. I tell you, every corner of the town pays homage to its long and rich history, and even a short walk can reveal all kinds of interesting things! And that was Saturday. Sunday morning, we woke up, had another sumptuous breakfast, and headed out of town to visit all the Commonwealth Cemeteries we could find, as well as a German one. We began with the Concrete Farm Cemetery, a smaller Commonwealth cemetery located outside of town. After stopping here to pay our respects to these soldiers and lay some Canadian flag pins on the Canadian graves, we continued on to Yorkshire Trench. This trench and the park that now features it was first uncovered in 1992 by a group of amateur archaeologists known as “The Diggers”, people who are dedicated to finding the bodies of the fallen that were never retrieved and giving them a proper burial. 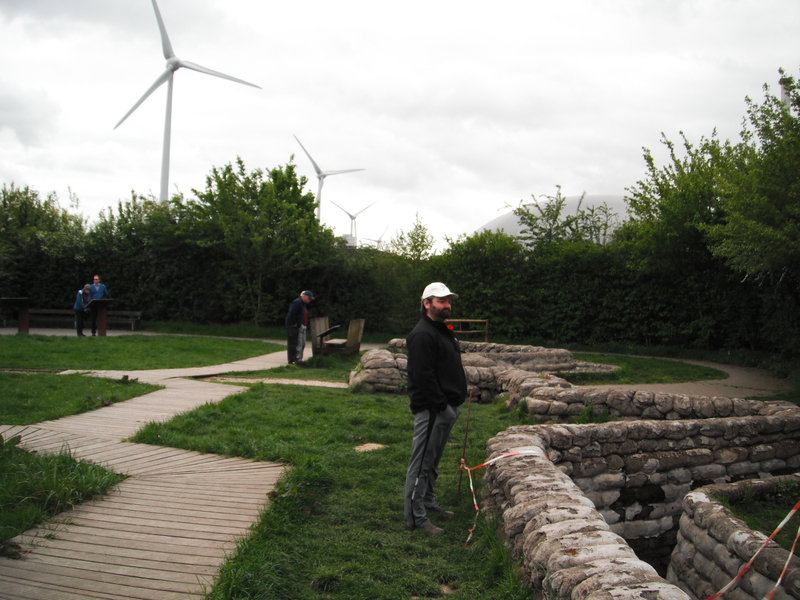 Between 1998 and 2000 they spent many hours digging and examining the trench, which also had tunnelled dugouts. At the time major construction work for new buildings in Ypres’ northern industrial zone was also being carried out. Hence, like so many other trenches, graves and unexploded munitions, this small piece of the Ypres Salient was discovered entirely by accident. And in addition to many artifacts “The Diggers” discovered, the remains of 155 First World War soldiers were uncovered – the bodies of British, French and German that were lost in battle and never recovered for seventy years. 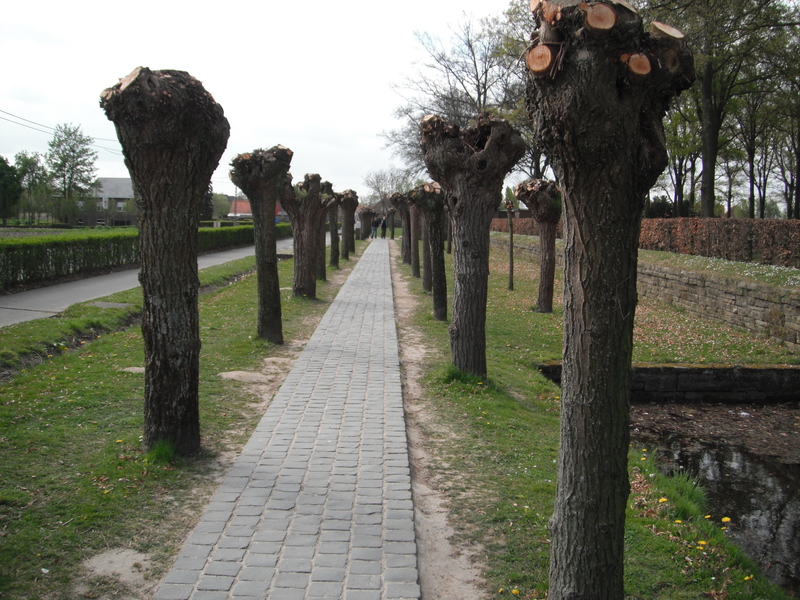 Then, it was off to Langemark, the German cemetery that was set aside by the Belgian government. Compared to the Commonwealth grave sites, this cemetery was very somber. Pruned trees surrounded the outer edge of it, the concrete bunkers that had served as dugouts during the war were now filled with leaves and detritus, and the many, many German fallen were interred four to a grave marker. And near the front gate, a single, mass grave known as the “Comrades Grave” contains the bodies of no less than 24,917 servicemen, including the flying ace Werner Voss. Inside the gatehouse, the names of the more than 44,000 soldiers who died during the many battles of Ypres are etched into the wooden walls. Of particular interest were the names of the 3000 German students who fell while crossing the field that next to the cemetery. Legend has it that these German students walked arm in arm and sang “Deutschland, Deutschland über alles” as they charged across the battlefield, and to their deaths. Yet another reminder of the futility and folly that characterized the Great War for all sides. It was also here that my father and I, while searching in the farmers field next to the cemetery, came across our most important keepsakes from our trip. As he knew from his previous visits to the countryside, the fields that once made up the Ypres Salient constantly turn up pieces of shrapnel, spent shell casings, and even unexploded munitions when the weather changes. In this last case, farmers come across these shells when the winter weather causes the ground to freeze and the soil pushes these shells to the surface. Typically, these are then removed and placed by the side of the road to await for bomb disposal crews who take them away and detonate them. But in the case of shrapnel, bullet casings and other pieces of wartime history, one doesn’t have to look very hard to uncover them. Simply walk into a farmer’s field or a dig anywhere in the region, and odds are good you will find something. We had a hard time searching the nearby field since a tractor was out turning the soil with some rather large blades. Still, we managed to find several fragments of exploded shells at the edge of the field, and after only a few minutes of looking. The grizzly significance of this was not lost on us: that so many artillery shells and bullets were fired in this region over a century ago that bits and pieces are still being found, and it took us only a few minutes of searching in a tiny parcel of land to find some. And of the four pieces that we pulled out of the ground, the first and largest was certainly the most recognizable. Roughly three inches long, an inch and a half wide, and over half an inch in thickness, this hunk of rusted metal had a curvature and striations on one side that indicated that it was an artillery shell. We guessed that it was British, and given its size, it most likely came from a 18-pounder field gun. The other two, much smaller, looked to be large bullet fragments, in that they were cored in the center and not that big. Still, they appeared rather large for a standard rifle or machinegun, so it’s possible they were from a heavy machine gun. Of course, its difficult to say since 100 years of caked-on dirt, rust, and wear can kind of obscure a fragments true size and dimensions. 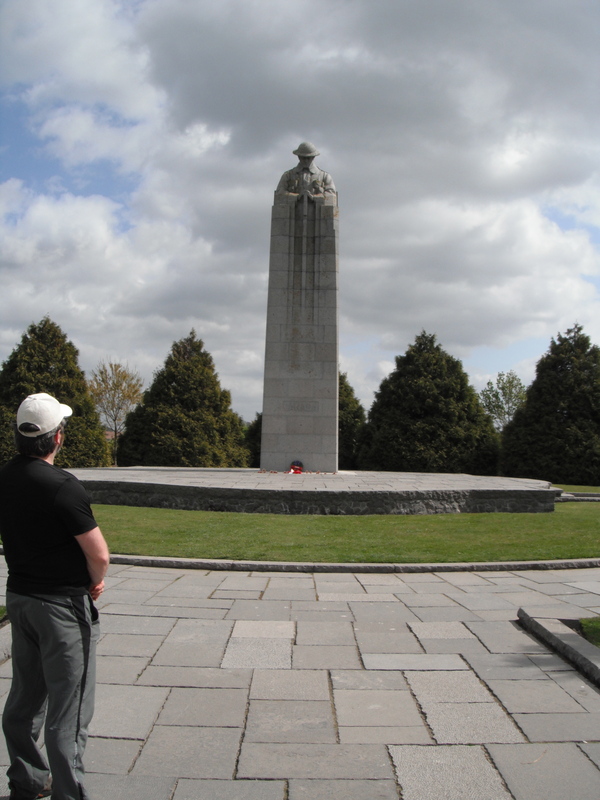 After that, it was on to St. Julien, the town outside of Ypres where the monument to the Canadian soldiers who held their ground during the first gas attack is located. While admiring the monument, my father spotted a fellow Canuck, who was identifiable from his Hamilton Tiger Cats jacket (his hometown). After spotting him, my father went over and promptly chatted him up. He does that a lot! 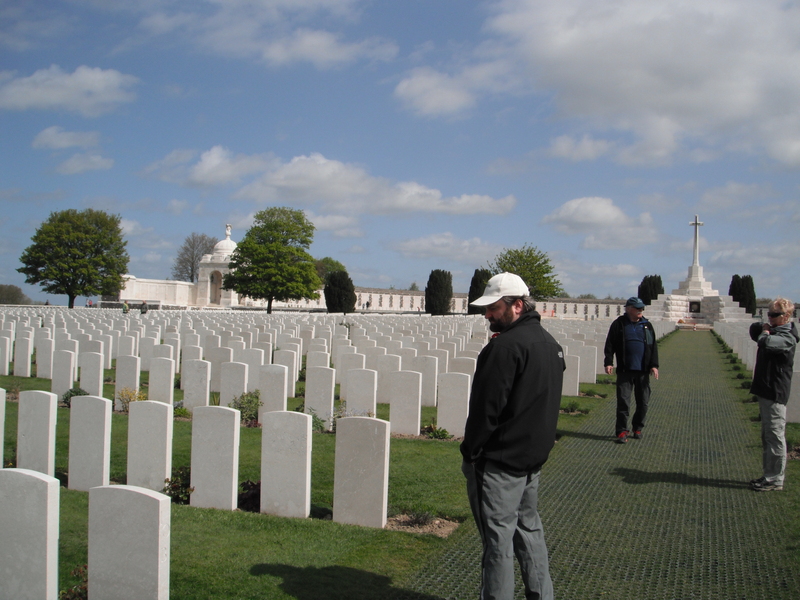 And then, it was off to our last stop for the day – the Tyne Cot Commonwealth Cemetery. 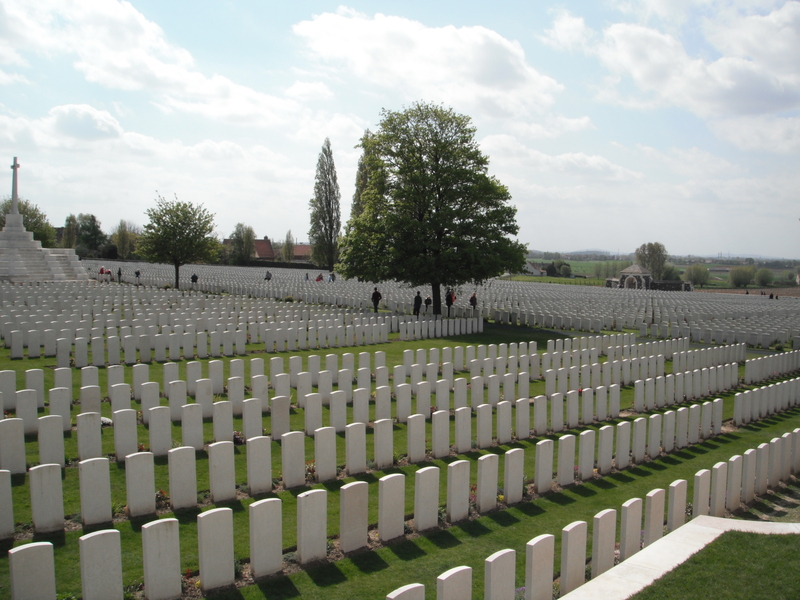 This cemetery, which is the final resting place of 11,954 soldiers who died in the Ypres Salient during the Great War, is the largest Commonwealth cemetery in the world. Of these, some 8,367 are unidentified, and their headstones are inscribed with the words “Known unto God”. In addition to these graves, there’s also the four memorial that honor the roughly 90,000 British and Commonwealth soldiers who died here – most of whom were never found or properly identified – with the names of each inscribed on the walls. We started with the Visitor’s Center, a small and somber museum, before working our way into the cemetery proper. Inside and out, we heard a recording playing where the names of all those who fell in the Ypres Salient were spoken on a loop. To give you some sense of how many men that was, the recording takes a full FIFTEEN YEARS to get through the entire list. Yes, more men fell in this region within the space of four years than can be even be named in that same amount of time. Unbelievable! Once outside, we walked amongst the headstones and looked for the telltale Maple Leaf that indicated that it was a Canadian soldier who had been buried there. On these, we placed Canada flag pins and thanked them for their service. I can tell you, being surrounded by so much death, and knowing the sheer scale of it, was quite overwhelming. After we had run out of pins and written our names in the visitors book, we hopped back in the car and drove back into town. The rest of the day was spent separately, with my folks having dinner on their own and Carla and I going out for a run. We spent about an hour running around the wall that encircles the old city, visited the Cathedral again, found a place to eat (a nice bistro called “The Goose”), and gorged ourselves on curried chicken, chicken wings, and salad, all of which was washed down by some lovely Belgian Trappist beers and a tall Pilsner. It was a nice, gentle way to conclude a day characterized by sober reflection and somber reminders. And then, the quiet sleep, knowing that it was our last night in Ypres and we would be leaving for the Normandy coast, and visiting the Vimy War Monument, the next day. It would be the day when we made our final visit to a monument dedicated to those who served and died in the Great War, and the first day of visiting World War II monuments, museums, and cemeteries. And to do it justice, I am going to need to give it it’s own post! Until next time, thanks for reading, and always remember how fortunate we are to live in a world where total war is a thing of the past. May we never forget, and never be forced to repeat the mistakes of the past! You guys really filled up the days with some amazing sights. Some of the memorial sites make me wondered if they hold the same heaviness and holiness that is thick in the air at the Pearl Harbor memorial. Its humbling. I love that the people of the regions make a daily effort to honor the fallen – we could definitely take a lesson from that.